For extreme NA race applications, the R3A triple-plate offers up to 550hp power handling in a lightweight and compact clutch system. Using a floating hub design also makes the clutch cheaper to rebuild. The clamping pressure of 1090kg is still acceptable for street driving, while offering great resistance to slip in drag applications. 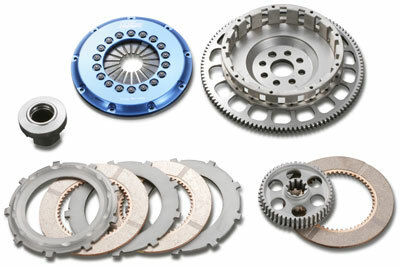 All versions feature a lightweight chrome-moly flywheel and gold-anodised billet aluminium clutch cover. The prices listed include the necessary bearing/carrier set or pull-push converter kit as required.